I am sooo excited about tonight's challah! 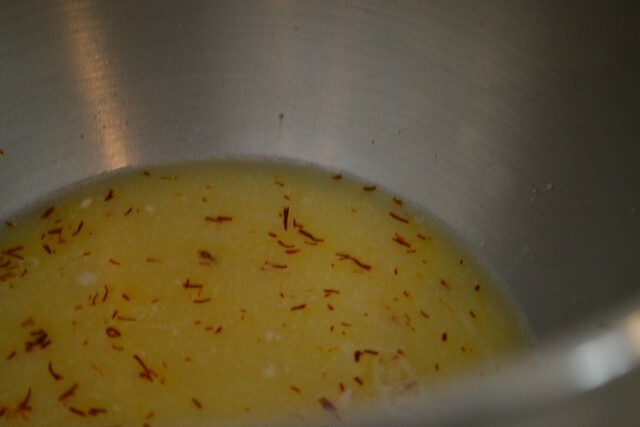 Mix water together with yeast, 2 tbsp sugar, and saffron. Allow to rest for around 10 minutes or until yeast creates little eruptions. Add eggs and oils and mix lightly. Add lemon juice. Mix in rest of sugar, salt, and flour. I ultimately needed to add more flour, about a 1/2 c. Knead by hand or with a stand mixer and proceed as your normally would. I let my dough rise for about three hours until it had doubled in bulk. 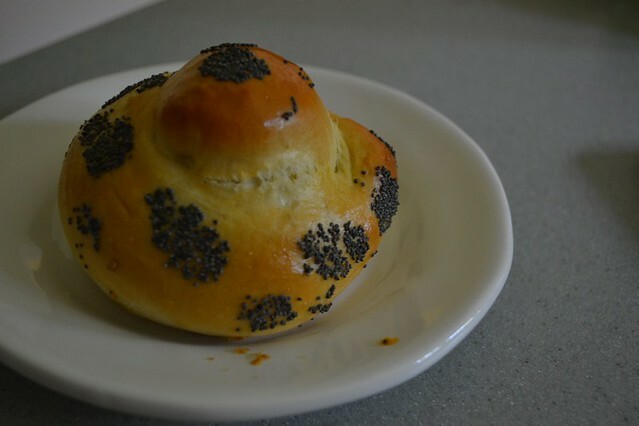 Braid and egg wash. Sprinkle with poppyseeds and drizzle with about 1 tsp lemon juice. Allow to rest another 30 minutes. Bake at 350 for around 30 minutes or until internal temperature reaches 180-200 degrees. I always cover my challot with aluminum foil at about 25 minutes if the top begins to get too brown. Shabbat Shalom for The Hazz and The Mrs. to you! It's a quiet Shabbat at home here with just The Hazz and The Mrs. We're having tomato soup and mac n' cheese with broccoli. Talk about comfort food. Nom nom. This Shabbat, we did a small batch with 1/3 bread flour, 2/3 all purpose flour. It turned out great (well, it looks great). 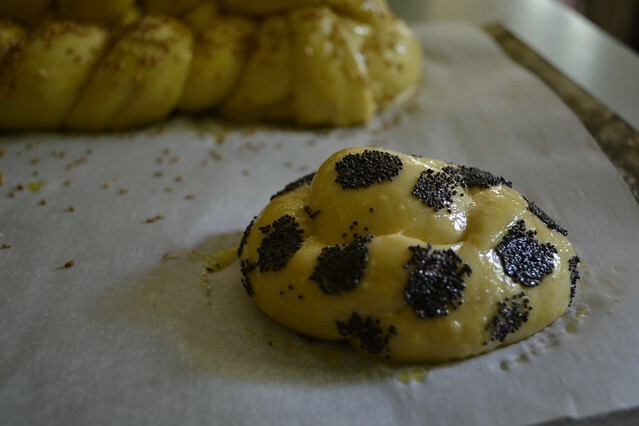 I'd like to introduce to you, POLKA DOT CHALLAH! This cute method I learned from This Good Life. I eggwashed the whole shebang then used my finger dipped in egg then poppyseeds to create the effect. I'm pretty sure the possibilities are endless. I want to do like my whole hand, it's so fun. 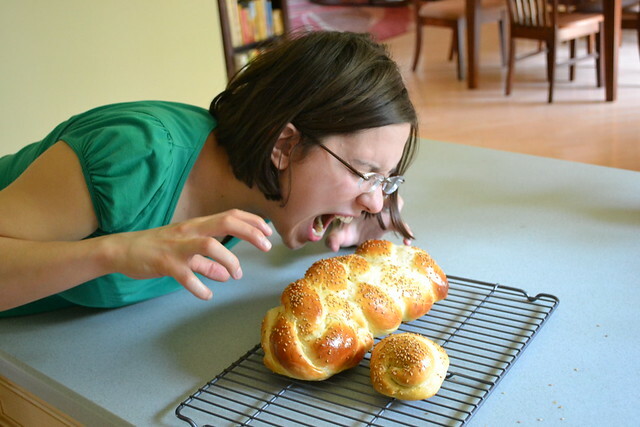 I'm soooo uninspired for challah this week. I don't know what to make. I know I can always make "regular" but last week's challah was such a bust. Luckily, we had LeighAnn's awesomeg guest post on Blueberry Challah to go in place of my pathetic loaf. It's warm here in Wisconsin. Well, actually that's not true. It's completely random temperature-wise. Last Friday it was in the 70s and humid. This week it was in the 50s and rainy. Tomorrow is predicted for warm again. These temperature problems are not good for my allergies (I'm avoided Allegra lately because although I like the clear sinuses, some of the other side effects are undesirable), my clarinet reeds (did I mention I'm a musician), and my challah... which turns into lumpy, shapeless blobs. I was actually really excited for last week's challah too... I had some bread flour for the first time to try. But I made my full batch recipe instead of my small batch. I don't know if that was the mistake or what. There was NO elasticity. No give. It was like braiding polenta, very much like the Spelt Challah. It was actually tasted great. But, it was such a bummer. The braids split and broke. I don't know what I did wrong. I was so embarassed, I didn't even take any pictures. The guests liked it, it tasted good, but it wasn't my usual standard. So, what next? I'm thinking about attempting bread flour again, with the small batch recipe and see if I have more luck. I also have a very generous King Arthur Flour gift card that The Hazz's mother sent me for our anniversary. So, what should I buy? Should I experiment with exotics? Or buy pans? A little bit of both? Any fancy recipes you recommend? Anything fun? Just words of advice? Talk me away from the ledge, folks! 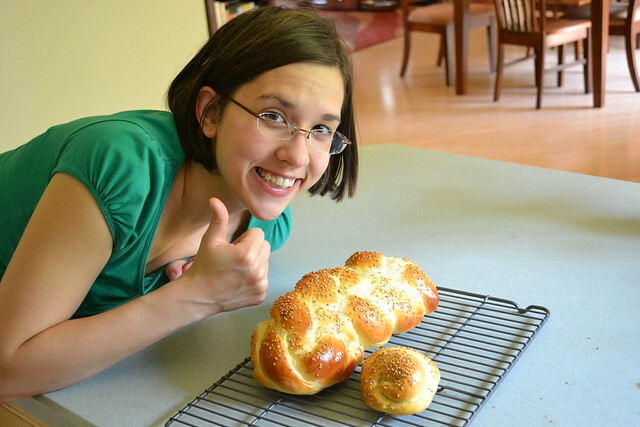 Today's recipe is The Challah Blog's very first GUEST RECIPE! 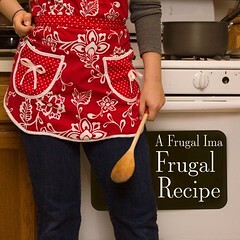 The following recipe is brought to you by Rabbi Leigh Ann Kopans of The Frugal Ima (whose Jalapeno Bread recipe we sampled a few weeks ago). Leigh Ann has really great, time saving, money-smart recipes on her blog along with other wonderful thoughts on Jewish living and making our homes meaningful places for our families and ourselves. Blueberry challah - For challah bakers and seasonal produce obsessors, blueberry challah is like that beautiful new girl in school who shows up just when things were getting too boring to take anymore. It’s the new mixed with the same old thing. The two belong together. It’s all you think about. It looks so beautiful, and smells so sweet. In your head, that is. 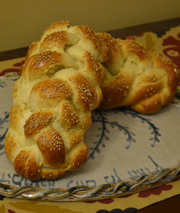 You must bake this challah. You can’t resist. 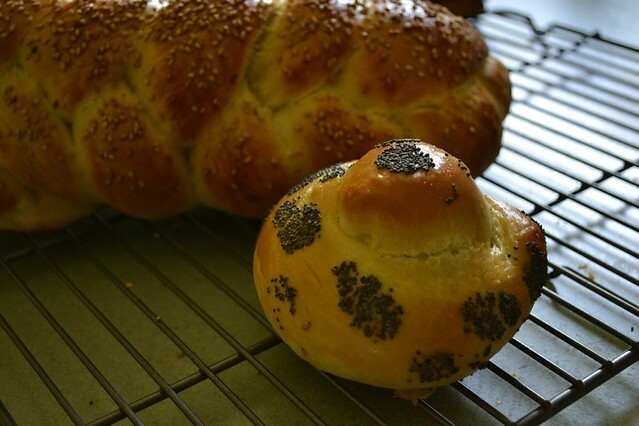 But here’s the thing - Blueberry challah is like a pair of star-crossed lovers – it can’t win. It’s impossible. Add juicy fresh berries to a dough that already stands precariously at the edge of being too sticky? Especially in the summertime, just when the blueberries are in season, and the humidity weekly threatens every Jewish baker with turning their challot into a sweating, melting pile of eggy goo? But channel Edward, friends. Attempt the impossible, and all your friends will be impressed that you were able to hold out long enough when you finally, finally, win your prize. 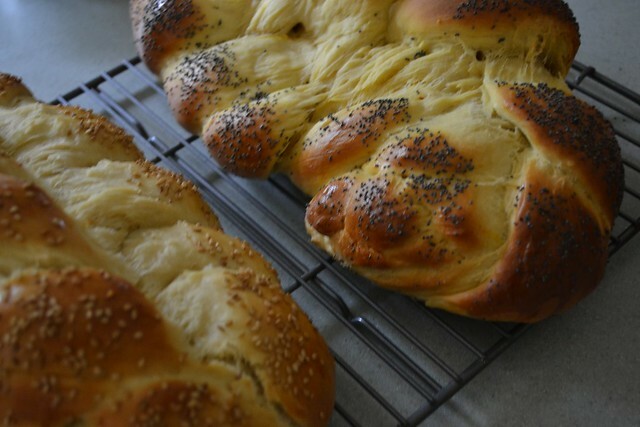 Make your regular challah dough, a bit drier than usual. (Amanda’s recipe on this site is great, and pretty close to what I used.) The higher the ratio of oil to water, the better – it will keep the dough from sticking to the work surface and aid in your stranding. When it’s almost doubled in bulk, you can start to strand. This is a sticky dough. Lightly flour your work surface – too much flour will just make your snakes skate around sadly, and will cause you to push too hard. 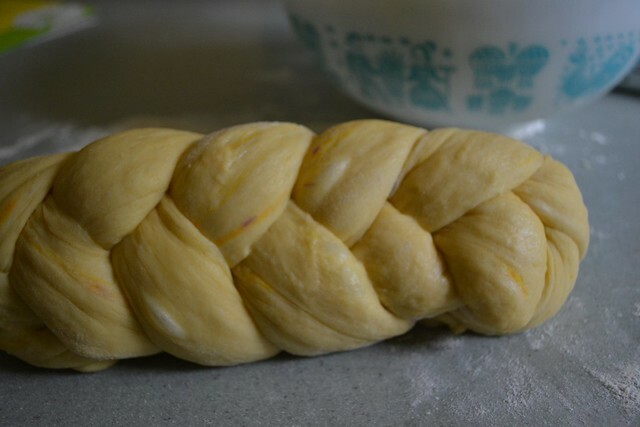 Before you braid, dust each strand with flour, so that they don’t stick together when you braid them tightly. When you beat up your eggwash, add some vanilla and brown sugar. 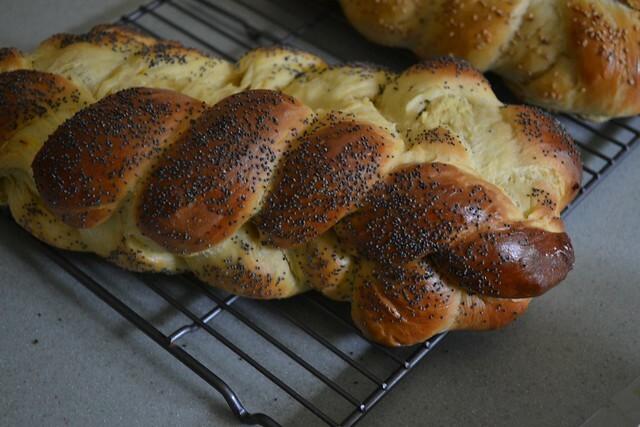 It’s no secret everyone wants to eat this challah, why not sweeten it up even more? Shabbat Shalom and happy summer from the Kopans Bayit to you!